Since 2011, 69-year-old Gangadhara Tilak Katnam has become a local legend, after having fixed over 1,300 potholes across the city with his pension money. 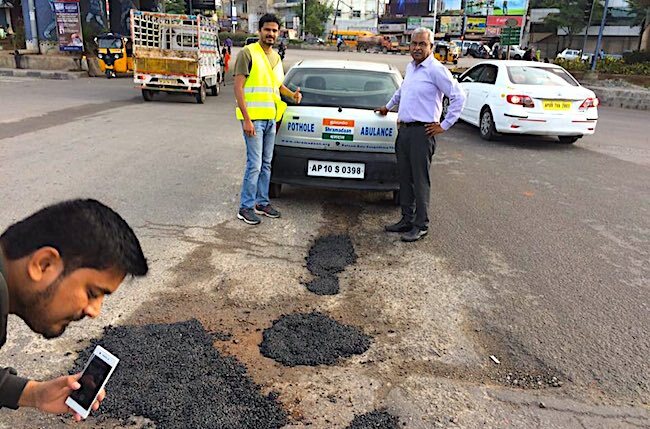 With rains in Hyderabad returning and turning the roads into a maze of potholes the city’s very own ‘road doctor’ has stepped in once again to fill these dreaded potholes. 69-year-old Gangadhara Tilak Katnam has become a living legend having fixed over 1,300 potholes with his pension money since 2011. And this time too when authorities have failed to rise to the occasion, it is Tilak who is leading the initiative to make commuting a little easier for the citizens. Tilak’s modus operandi is fairly simply. “I carry around 300 kg of the required equipment in my car. Whenever I notice a dangerous pothole, I stop the vehicle and fill it up," he says. For all his years of experience of filling potholes, he can now identify the extent of the damages. "There are three kinds of damages to the roads that I have observed. The first one is major damage, where a new road has to be laid. The second one is big potholes, that will take several bags of material to fix, and a third one, which is smaller potholes and craters in the road," Tilak explains. Tilak was inspired to start his mission, after his car suddenly fell into a pothole one day, and splashed muddy water onto a few street kids nearby. Since then Tilak carries 8-10 gunny bags full of tar, gravel and other such material, to fill a pothole wherever he spots one. For Tilak, these potholes are not just a matter of mere inconvenience. He says these potholes are downright dangerous and life-threatening in some situations. "Many times we observe that a car is able to dodge a pothole and drive over it, while a two-wheeler coming from behind will not see the hole, and get into an accident," Tilak says. "We can't take even a smooth road for granted. In some areas, there are manhole covers, that project out at least 3-4 inches from the ground, and someone could really get hurt," he adds. While it started as a solo mission, Tilak inspired others also to pitch in. 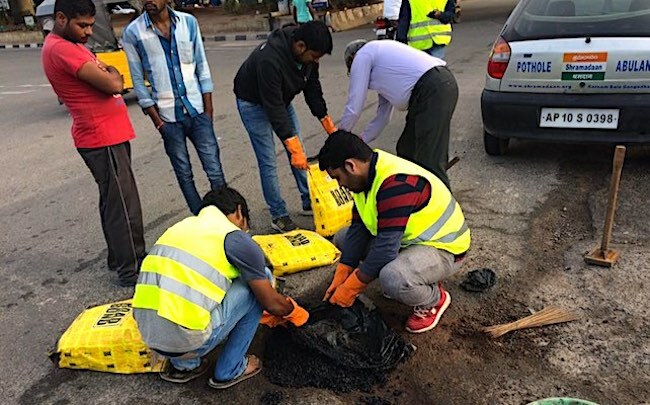 In 2012, he started ‘Shramadaan’ movement—a voluntary initiative where students and young adults meet and repair potholes. Tilak has been getting a lot of help from youngsters, who step out to help him fix the city's roads. "It makes me very happy to see so many youngsters pitch in. Techies and college students come with me, fix a pothole and then go to work. I tell them that they don't have to, but they say that they don't mind doing this, and going an hour late to work," he says. That the authorities have failed to address the issue is evident but Tilak says that even citizens are to be blamed for the state of the roads. "We must question the authorities. But one of the biggest reasons why roads erode is because of water that is let out onto the streets by house owners, restaurants, and other commercial outlets. This water stagnates on the road, making things worse for all of us. Even water tankers, that leak water while standing at a signal, are part of the same problem," Tilak says. "My only request is that people find alternatives to this, as several crore rupees from the state exchequer can be spent somewhere else. We should fine people who drain water on to the roads, while also sacking contractors who do not do their job properly," he adds. While Tilak is one of the few people to take matters into his own hands, others are adopting unique methods to protest against the poor quality of roads. Earlier this month, a politician called on citizens to send him photos of the 'best' potholes in the city, which evoked a great response, with hundreds sending in pictures. The campaign started by Congress leader Marri Adithya Reddy asked residents to take a picture of any pothole in the limits of Greater Hyderabad Municipal Corporation (GHMC) and mail it to hydpothole@gmail.com. The winner of the contest, who finds the 'best' pothole, gets a cash prize of Rs 5,000, while the second prize is Rs 2,500. In the first week of September, the Telangana government said that it will take up various development works in Hyderabad at a cost of Rs 20,146 crore, as part of its plans to make it a global city. Out of this, the government will spend Rs 6,700 crore on road development alone, it said. The GHMC has also said that strict action would be taken against those, who let out water on the road. Last month, the municipal body fined a construction firm Rs 10 lakh and filed a case against the company at the Banjara Hills police station for damage to public property, after the builders pumped water from their cellar, on to the road.